Participants of a Birthright Israel tour for people with special needs checked in at John F. Kennedy International Airport before departing Sunday for the Holy Land. Tema Krempley, 23, has had Birthright Israel on her mind for a long time. For Krempley, who graduated this year as a religion major from Ohio Wesleyan University, the free 10-day trip of the Holy Land provided by Mayanot offers the chance to learn more about Israel and visit Caesarea, where her favorite poet, Hannah Senesh, wrote her favorite poem. “I’m very excited because there’s so much to see and so much to learn,” Krempley revealed before departing John F. Kennedy International Airport on Sunday. 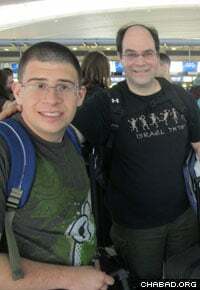 Krempley was one of a batch of young people gathered outside of El Al Airlines’ check-in desks getting ready to depart on a special Chabad-Lubavitch run Friendship Circle/Taglit-Birthright Israel trip. Now in its fourth year, the free trip gives Krempley and other young people with special needs the opportunity to take part in the carefully-tailored program. The 34 participants, 28 of whom are individuals with special needs, are in for an Israel experience designed to connect them with their heritage and the community as much as possible, said Rabbi Zev Baram, executive director of Friendship Circle Philadelphia Region South, part of an international network of programs that pair teenage volunteers with children with special needs. 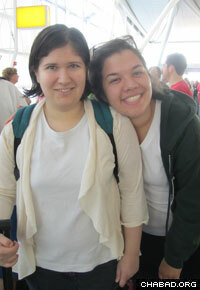 Hindy Finman, right, of Oak Park, Mich., is one of the Friendship Circle volunteers on the trip. Participants came in from Philadelphia, Quebec, California, Ohio, Maryland and Boston to take part in the adventure, made possible through a partnership with Birthright trip provider Mayanot, which dedicates one bus a year to the Friendship Circle. The trip fits in with Friendship Circle’s goals of both raising awareness of people with special needs and helping them integrate with society, and fueling the Jewish pride of those with special needs, explained Baram, who is also blogging about the journey at www.phillyfriendship.com/blog. Participants will take part in age-appropriate activities on a schedule that allows for orientations and discussions to help activities resonate with participants; camel rides, beach games, and tours of Jerusalem’s Old City and the Dead Sea are just a few of the items on their itinerary. Jeff Marcus and Joan Levin, of Philadelphia, were dropping off Samuel, 18, for the trip, which they heard about through one of its adult coordinators. They had even hoped to send him last year, Levin said, but he was a month shy of his 18th birthday. Not knowing how he would respond to faster routines, the couple said they were glad to know he would be supported on this, his first trip away. “The staffing [ratio] is very high and everyone has wanted to know right from the get-go anything that is particular to the participants in order to support them,” said Levin. This is the fourth year the Friendship Circle has coordinated a Birthright Israel trip. Samuel’s computer monitor has a picture of the Western Wall as wallpaper and he has been very involved with Judaism for many years, explained Levin. His parents hope the 11th grader comes away with an enduring love for Israel, a stronger connection to his Judaism, and greater connections with fellow Jews. Omer Rosenblith, 26, of S. Louis County, Mo., has been to Israel with his family but said he was looking forward to traveling with his peers. “I’m going to meet some new guys my age and I’ll be going to some swanky hotels like King Solomon and King David,” he said. Sora Margolis, program director at a large New England Friendship Circle, spoke about the power of the trip, a hallmark since its beginning.